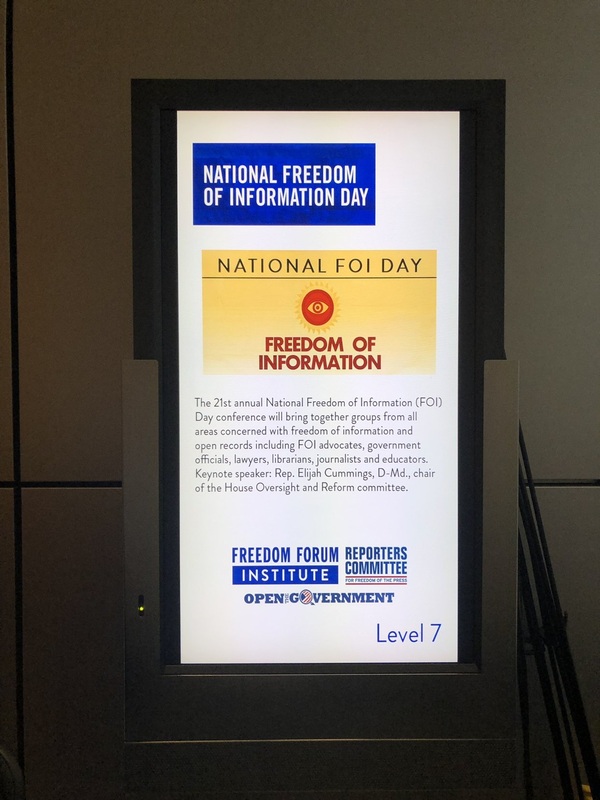 In the lead up to Sunshine Week, dozens of organizations came together to focus on FOI efforts at an event sponsored by the Freedom Forum Institute, The Reporters Committee for Freedom of the Press, the American Society of News Editors, Fix the Court and Open the Government. RCFP kicked off the day’s events with a discussion on the impact of continued assaults on a free press and tools like the Freedom of Information Act. Fix the Court addressed transparency in U.S. Courts, asking why cameras aren’t allowed in the Supreme Court and addressing other ways in which the judiciary lags behind the other branches in terms of transparency and accountability. Open the Government released a report Government Inc.: Amazon, Government Security & Secrecy, and held a panel discussion on the secrecy stemming from the government’s reliance on private contractors to provide the technology to support military operations and law enforcement, including mass surveillance tools. The day’s highlights were addresses from two Members of Congress. Rep. Elijah Cummings (D-Md), who received the Sunshine in Government Award from News Media for Open Government, extolled the virtues of openness and urged civil society to keep up the fight. Rep. Jimmy Gomez (D-Calif.) shared his experience being misidentified by facial recognition software as someone who had been arrested, and his ongoing efforts to bring more accountability to the suppliers of such technology. Later in the week, the Government Accountability Project, Union of Concerned Scientists, and the Sunlight Foundation focused on science and transparency in the Trump era. Their discussion focused on censorship of research, efforts to limit the communication of federal employees and contractors, and reprisal against employees who blow the whistle on serious abuses. The Environmental Protection Network released a report, Protecting Science at Federal Agencies: How Congress Can Help, GAP shared resources on whistleblowing, and the Web Integrity Project at the Sunlight Foundation demonstrated its new Website Tracker Tool used to help track shifts in public information, access to online resources, and changes in stated policies and priorities on government websites. The National Security Archive released its FOIA audit with startling findings: five federal agencies have FOIA requests going back more than a decade, including one that is more than 25 years old. The survey also found a correlation between agencies with the oldest FOIA requests and those with the largest FOIA backlogs. And NSA’s Nate Jones’ opinion piece in the Washington Post captured why Congress must strengthen FOIA as a government accountability tool. In our next post, Sunshine and Shadows – Part 2, we will look at this year’s Sunshine Week happenings through Congressional and Executive Branch lenses. Stay tuned.